Our product range includes a wide range of upvc submersible riser pipe, upvc borewell pipe, upvc column pipes for boring, upvc submersible column pipes, riser pipes for boreholes and upvc boring pipes. Successful installation from 100 ft. to 1400 ft. depth. Freezing lock system for extra safety. 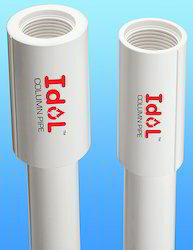 We are leading manufacturer of uPVC Submersible Column/Riser/Drop Pipes. Smooth internal surface allows friction loss (free) flow of water with energy saving and tensile strength in considerable amount. We are leading manufacturer of Borewell Column Pipes. Water rising from submersible and jet pump for irrigation, domestic, industrial mining. A perfect replacement for MS, GI, and SS Pipes. Suitable for salty, sandy and chemically aggressive water. Light in weight & easy to transport. Easy and low installation cost since no need of threading tools or solvent cement for fitment. 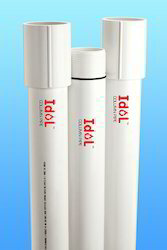 Idol uses latest extrusion technology, standard quality control procedures and has fully equipped laboratory ensuring the best quality of pipes with perfect dimensional accuracy. Idol uses CNC machines for threading of pipes and couples with high accuracy tools to ensure the exact dimensions thereby resulting in easy and comfortable fitment of pipes. This special formulation also ensures that the threads do not get brittle and break even after loosening and tightening several times during the life span. This innovative technique is for making pipes thicker in the threading end to compensate for material removal due to threads. Therefore saves raw material consumption and at the same time provides much higher strength to the pipes. We are a reputed organization engaged in offering an extensive range of uPVC Submersible Column Pipes.These products are manufactured using premium quality material and other necessary components. We also offer these products in customized form as per the specification detailed by the clients. The offered range is appreciated for their high tensile strength, durability and high performance by the clients. Clients can avail these products at the most nominal rates. Our clients can avail from us Raiser Pipes, which are used on floating offshore drilling rigs to create a fixture. It is developed between the top of the well-bore located on the ocean floor, the drilling equipment located above the surface of the water. In the setup, a riser pipe/ marine riser facilitates drill stem from the drilling vessel to the wellhead and also as a conductor of drilling fluid from the well to the vessel. To compensate for movements of the drilling rig caused by waves, the riser consists of several sections of pipe and include special devices.